The past few posts have been about travel. I've been avoiding talking about home as my bout with Aplastic Anemia is not getting easier; it's still an unpredictable roller coaster ride. It is easier for me to reminisce about faraway places than deal with the battles I wage at the health front. I thank God for my family and their unyielding support. Home is still a wonderful place, it's just connected to something I don't like. In my effort to recognize home as a great place. Today, I'll talk about home. Well, about my backyard garden. Every time spring arrives, starting the vegetable plot is something that I look forward to. Every weekend, I'd ask Kepi if the ground is safe from frost or is it okay to start the vegetable garden yet. For me, having my hands dirty and planting seeds that will soon sprout into plants keeps me close to reality. That from smalls seeds, these lovely life-giving plants would grow. It also makes me realize that all I need is one small seed of hope in order to survive the unbearable heat and the turbulent storms of the future. The backyard garden is thriving, and it looks like it's a world of its own. I can't wait when it's time to harvest and share them with friends, neighbors and coworkers. The Okras are really thriving this year. In fact, my small vegetable garden is thriving. On the herb side, I have a potted Parsley, and I intend to plant more potted herbs and bring them inside the house during the winter. I'm hoping these should be ready for harvest in a couple of weeks. Here's my small vegetable garden L to R: Tomatoes, Green Beans (front row), Yellow Peppers and Eggplants (Back Row) and Okras. Not a lot for the first picking but I wanted to get these before they get too hard and inedible. I also got one Eggplant the other day which we've drizzled with Olive oil, a little salt and baked in the oven. HOME is truly a BEAUTIFUL PLACE. Hope you feel better soon Kayni. I can only seemn to grow herbs in the ground. Maybe it's the heat, but a lot of them die in pots here. Except for basil. That does well in a pot as long as we water it every day. And it is quite a magical plant because every year the seeds fall in the soil and grow like weeds the next spring. Thank you, Loree. The hardest part of having this disease is the psychological battle. I have to learn no to be afraid and not to fear it. It's still a practice in progress. As for gardening, at first, my plants were dying because of the heat here. I tried watering them early in the morning and when it gets too hot, I water them the second time in the evening. I just love having plants. My tomatoes are the same, a lot of them just grow back on their own the next season. hugs kayni. remember what they say that it's always darkest just before dawn. hang in there. because we are going away for a month this summer, we didn't pay too much attention to our garden, although we have gathered green beans and tomatoes already. i have a long rectangular pot that i used to grow lettuce, but the cats have done a number on it many times. they think it's their potty. you see i have a growing number of feral cats that call our neighborhood home and they act like it too. but my plum tree is full of fruits. i hope my brothers come over to pick fruits while we're away. Oh hang in there, Kayni. You're right it is the psychological aspect that drives us bonkers. Well, we are just human so we are consumed with negative thoughts that seem to haunt us everywhere we go, even in our dreams! Oh I love okras! It is one of my fave veggies but I eat them in moderation as my knees start to ache probably from uric acid. 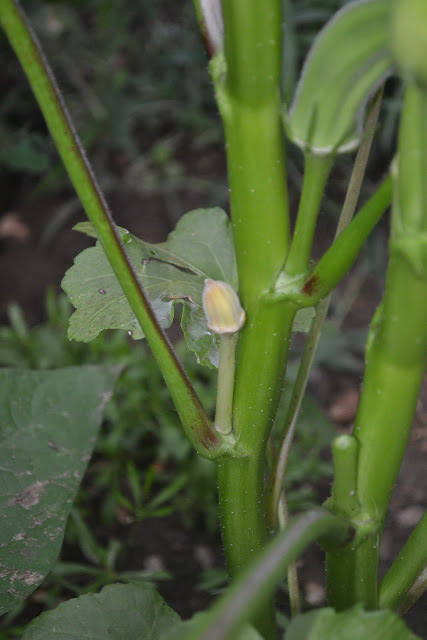 My favorite vegetable is okra, I have always wanted an okra farm but then again, I don't have time for rearing this, my garden has been neglected every time we have to stay at my MIL's for weekday's. i hope you'll be better kayni! stay healthy! mwah! ohhh, hugs for you kayni. hope you'll be better soon. your garden looks great! and the okra is so beautiful. i love okra! my frustration with living in the city is not being able to have a garden like you have. Anyway, hope you feel better now and do take care Kayni. Hi Kayni. I read your comment on my blog. Really? You were at my cousin's wedding? Aww missed opportunity to talk to another blogger! Anyway, I'm sorry to hear about your health problems. But I love your post on your vegetable garden. I've been planning to have one too! I think you just made me want to make it true asap. Take care Kayni! I was thinking of doing that in our backyard too but I don't know where to start. It's great that you planted your own vegetables in your garden. Nothing beats freshly picked veggies.